BOOK Holidays 2019 & Winter of 2020 NOw! 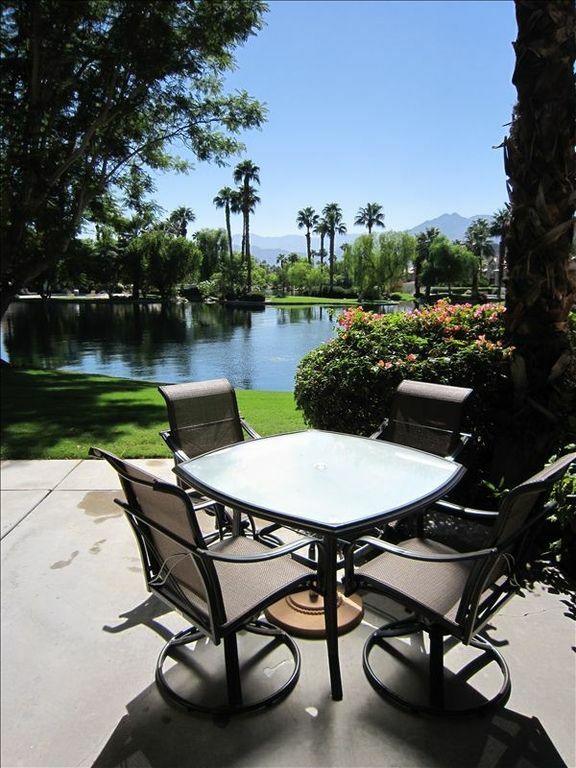 Enjoy the desert sun, all the great events, parks and attractions that the Coachella valley has to offer... then relax on the patio by the lake. Fully renovated 1620 sq ft condo. Brand new - EVERYTHING! This contemporary luxury hotel-style home is ready for your next getaway or family vacation. Ideal for a single couple or multiple couples and families. Enjoy this light filled home with stunning lakefront setting and private views. With no other homes in front, you get to enjoy the lake and mountains while relaxing in the living room or sitting back on the patio. Adjacent owners are weekenders, everyone is very helpful and friendly. Designed for both relaxing and entertaining, this is your prefect home away from home. A fully stocked gourmet kitchen includes built in wine cooler, gas range, ice maker and bar. Comfortable living room furniture with lots of seating, open plan dining area and private lakefront patio let you enjoy indoor and outdoor living at its best. The den features a HD TV and DVD, Queen sleeper sofa, extra seating and storage. Custom sun-stop panel blinds allow you to see the view while enjoying your privacy. This home features large bedrooms complete with pillow topped mattresses and premium linens. Master includes walk-in closet, large en-suite bathroom, flat screen HD TV, sitting area and private balcony. Guest rooms are set away from living room and master suite for added privacy and morning sun; they include large closets. All bathrooms are completely renovated and feature comfort height vanities, walk-in shower (Master), soaking tub (Guest), hair dryers and spa like settings. All furniture is hand picked and no detail missed for comfort and use. PGA West is your perfect enclave. This complex has 54 swimming pools and spas…. 6 private and semi private golf courses. A health and racquet club with plenty of social activities. Just 30 minute drive from Palm Springs Airport. Rental includes Guest Activity Book and events listings, unlimited US and Canada calling, Free WI FI, I Pod docks in every bedroom, I Pod stereo, bicycles, pool floats.... We want you to enjoy our home as much as we do and all that the valley has to offer. Keywords: Condo, family friendly, fully renovated, contemporary luxury, premium linens included, golf, gated community, private, gourmet kitchen, all brand new. As a family we love to travel, ski and enjoy the sunshine. I have owned and operated restaurants, managed fly-in fishing and hunting lodges and currently run a successful Financial Advisory practice. We wanted to share our holiday home with others who enjoy sunshine and a great hospitality experience. There is no doubt that our home will be your home away from home. PGA West is the home of golf in America, it is also a wonderful residential community. The neighbors are welcoming and look out for each others homes. It is a great community for golfing, walking, biking, swimming and taking in the views. The safety and the feeling of community is unprecedented. The homeowners association is fantastic and the staff on the gate are very dedicated to your safety and enjoyment of PGA West and your time in the desert. This property is located in the La Quinta, right up against the mountains, with great amenities. Bike trails. hiking, golf, shopping, arts, national and state parks - it is all right here and you can do it all within 5 -20 minutes. Ride a bike to the grocery store or take a short drive to world class shopping, concert halls and museums. While at PGA West enjoy leading golf practice facilities, golf schools, and courses along with the stunning Stadium Clubhouse dedicated to the great names of the game. toilet, Private main floor powder room with all the extras. South Facing with Mountain Views. (2) Free long Canada & US calling. Premium linens including bath and pool towels. Relaxed and open living room with ample seating and direct access to the lake front patio. Ultra Quiet and stainless steel for bacteria resistance. Brand New w/ Ice Maker & Water. Separate wine cooler. Full gourmet gas range with broiler and five burners. Over range and perfect for fast fixes. Serving ware for 12 quests, every gadget and accessory you could want...including electric juicer. All matching, new and high end. Dining Table for 6 with access to the lake front patio for great BBQ and gatherings. 42 HD TV in the Den and 30' HD TV in Master Suite. Includes HBO and Movie Channels. IPod Stereo in living room and IPod dock radio/alarm in each bedroom. Assorted local attraction guides, travel books and fiction reading selection. (4) I Pod docks in all bedrooms and living room. Master Bedroom private balcony with lake front views. Adult (1)Mens and (1)Womans 21 speed cruising bikes. (1) girls bike 6 - 10 yrs. Stainless Steel BBQ with accessories. Large Patio Off Living Room and Dining Room right on the lake. Surrounded by great golf courses within 5 minute drive. Champion Practice facility and golf school at the PGA West Stadium Clubhouse. Hot Tub located at each pool. Guest book with comprehensive information on restaurants, events, contact numbers, golf courses and much more included. Two brand new comfort cruiser bikes with helmets for your enjoyment. Bike lock and tire pump provided. This is our third stay at Heidi's property when we visit relatives at PGA West. It's a wonderful place. The unit is well laid out with separate living room, dining room, kitchen and den. The three bedrooms upstairs are all spacious and enable each of our daughters to have their own room. The kitchen is very well equipped. And the view out the windows is spectacular - mountains, pond, geese, ducks, etc. We couldn't recommend it more highly. Thank you Fred and family. It is a treat to have your family stay with us year after year. We recently stayed at this property for a week-long family vacation. We felt like we were staying at a high-end hotel with all of the bonuses of a condominium. It was very clean. The beds were extremely comfortable. It was well-equipped. We were hard-pressed to think of anything that was missing which would have made our stay more perfect. The location is great if you want some rest and relaxation, with fun activities near by. The proximity to lovely pools and hot tubs couldn't be beat - a short walk up the street! What you see is what you get. No disappointments here! Not a complaint - merely a heads up - if you want to use the BBQ check for propane as it is the renter's obligation to fill the tank and if it was used up, you will need to refill it. Thank you Sarah for being a great guest. Look forward to having you back on your next trip to the valley. My family (4 of us) had a fantastic stay at this great property. We were afraid that there may not be a lot to do at that time of the year, but were we wrong! There were hikes, shopping, mini golf, great dining, robo-lights (strange but wonderful), museums, as well as a jeep tour of the desert and a day trip to San Diego to visit their zoo. Even if you don't play golf or tennis there is lots to find and do in the Palm Springs area. The property was very clean and modern... perfect for a family of four as the kids got their own bedrooms. All the amenities were top notch... from the kitchen appliances to the entertainment systems to the in-house washer and dryer. Our kids were looking forward to hitting a pool and the hot tubs... and December, even in Palm Springs, can be a little cool... but the pools were actually heated are were almost bathtub temp so no issues with getting out for a swim! A big hit for us was the ponds at the back of the property... they were filled with ducks, geese and even a swan. There were four particularly friendly ducks who would waddle by each morning and watch us through the dining room sliding patio door. Cute little guys! All in all it was a wonderful stay at a great property and the owner was really responsive and helpful... 10/10! Thank you for using VRBO and our vacation home for your family getaway! We appreciate the review and look forward to having you as guests in the future. I have stayed at this house 2 times now and can't wait to go back! The house is absolutely beautiful and has a great open feel. It's remodeled, comes equipped with every appliance or item you might need during your stay, and it feels very nice and homey. The bedrooms are spacious and the beds are very comfortable. We enjoyed riding bikes too. The view outside over the lake and mountains is stunning! You really feel like you are in paradise. The homeowner (Heidi) is extremely friendly and easy to communicate with. I couldn't recommend this location more! I hope to return soon! My husband and I thoroughly enjoyed our stay. The condo is very nice, and a pretty location with good views of the lake and the mountains beyond. Well equipped kitchen.....and we enjoyed having bikes to ride around the community right there for us. We hope to return again. We totally enjoyed Heidi's rental at PGA West. The accomodation was definitely 5 star. There was nothing missing. The very well equipped kitchen was a joy to have during our month and a half rental. As well the very modern rental had nice bedrooms on the upper floor. It was great for a family. Our children really enjoyed the bicycles, as well as the pool toys that were included with the rental. The beds were very comfortable in all three bedrooms and the view from the master bedroom was amazing. We hope to be able to rent this nice condo in the future. Heidi and Sybil (property manager) were also great to deal with. This vacation home is centrally located with easy access to San Diego (2 hr drive), Disney Land / LA (2 hr drive), Lego Land (1.5 hr drive), Joshua Tree (1 hr drive)....just to list a few locations all within reach. There is fantastic hiking, biking and sightseeing right out the door in our neighbourhood. A perfect location for all ages and interests. We provide a rental agreement with all terms and conditions for renters protection. Multiple month rentals receive additional discounts. Welcome letter, events book and household support all provided.